* It will hold the concrete specimen of 100mm diameter 50mm thick. * It will be provided with rubber gasket and washers for achieving leak proof. * Stainless steel bolts with washers and nuts will be provided to hold the specimen rigidly. distributed through the brass mesh. * Each cell will be provided with openings in top for pouring chemicals and the temperature sensors. The openings can be closed with lids. * The volume of chemicals within the chamber shall be 250ml. • The DC power supply for the cells can be varied from 0-60 volt continuously. • TWO numbers of Four line LCD display are provided. • Each LCD display indicates the values for four cells. LCD display1 will indicate for cells1,2,3& 4. 99.9 deg Centigrade (maximum values). 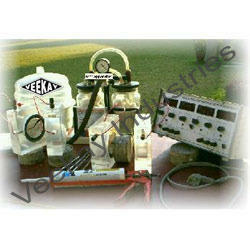 Looking for Rapid Chloride Permeability Test Apparatus ?